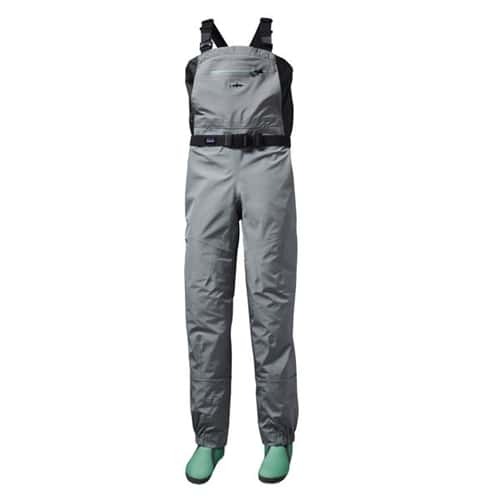 Already a favorite of female anglers for their outstanding fit and quick drop-seat functionality, Patagonia’s 2016 Spring River waders feature newly streamlined gravel guards and better-fitting booties made from denser, more supportive neoprene with a warm and cozy poly-grid lining. Striking an ideal balance between comfort and durability, these technical midweight waders offer refined performance for the widest range of fishing situations—from scrambling up high-gradient freestone streams in the summer to layering up for the deepwater steelhead dance. Come see us to try on a pair and check out our entire Patagonia fly fishing lineup. Designed, tested and built with input from some of the finest female anglers in the world, our Women’s Spring River Waders have been updated with more streamlined booties and gravel guards for a new level of comfort, performance and durability. The puncture-resistant, superbreathable, 4-layer, H2No® Performance Standard polyester microfiber fabric package keeps you comfortable and dry in range of conditions, and it’s built using Single Seam Construction that routes critical seams away from areas of high wear for greater durability. Waist-mounted EZ-Lock suspenders allow easy conversion from chest to waist height for versatile comfort; with front and back TPU slide-and-lock latches for security when wading deep. Innovative rear-buckle system provides drop-seat function for quick relief. If you fish in and out of boats, you’ll appreciate the new flat-panel gravel guards: they drain water more quickly than our old design, in addition to better resisting abrasion and wear while hiking or wading. Our improved booties are lined with a warm and comfy poly-grid; have a more anatomical, sock-like fit; and are made from a denser 4mm neoprene that resists compaction better over the long haul. Other fishing-friendly details: internal, TPU-waterproof zippered pocket keeps cell phone and alarm fobs dry; Hypalon® utility keeper holds tools for easy use; reach-through kangaroo-style handwarmer pocket; external zippered storage pocket; and a raised Fitz Roy Trout logo to top it all off. These are my favorite waders I've tried thus far. They fit me perfectly, especially the feet which seem to be hard to get correct. I like that they have everything I need and are very functional. I like that they fit me well unlike the men's waders. Patagonia does a great job designing quality outdoor products for fly fishing. They are also the only company I buy my gear from because they know how to fit women. They are not putting us in smaller mens gear. They have style too. Thank you My only problem is with your video. Your spokesman states that the woman's spring river waders have merino wool in the booties. They don't, and I bought them for this reason. Please correct that.